Hidden Cove Beach House- Ketchikan's Premiere Vacation Rental! Hidden Cove is truly a one of a kind property in Ketchikan. Our Hidden Cove Estate Beach House is a quality built craftsman style home and is set on 3 acres with 413 feet of beach! 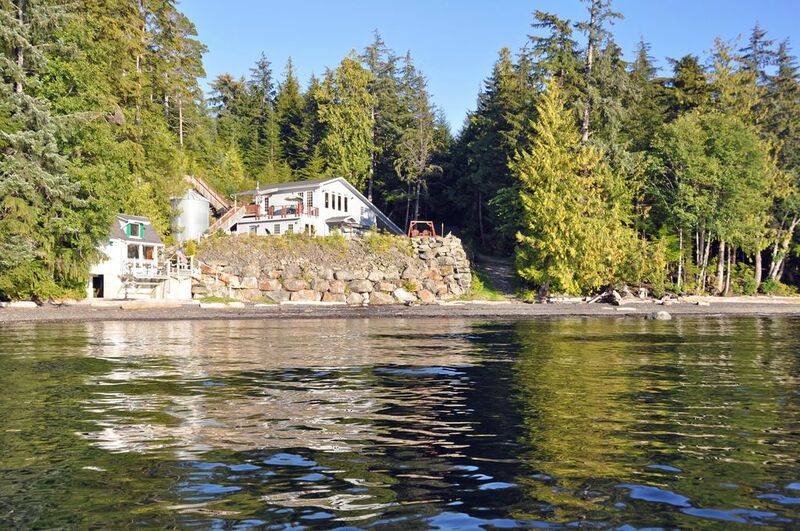 This creates the rare and most private ocean front setting in Ketchikan. From the house and property you can see Guard Island Lighthouse, Prince of Wales Island and the Cleveland Peninsula. All varieties of marine vessels, cruise ships and float planes pass in front of the house along with Orcas, sea lions, seals and humpback whales. The sunsets are amazing and can be enjoyed year round! Our repeat customers are a good indicator that we are providing one of the finest homes in Southeast Alaska for your Alaskan adventure. View our site. Your hosts Ray and Kathy live 5 minutes away and are readily available to assist with your needs. Hidden Cove is very close to both marinas(less than 3 miles) where you can rent 20-22 Ft covered aluminum boats powered with 90 HP up to 225HP HP Yamaha/Honda engines and outfitted for any kind of fishing. Smaller skiffs available too! Fish processing and freezers provided at the marinas at very reasonable cost. They will ship your catch for you or have your fish boxed and ready for pick up prior to your flight. Kayaks can be rented at Knudsen Cove and possibly delivered to the house (they have delivered kayaks to the property for our guests in the past). The Hidden Cove beach house has three bedrooms, two of them with pillow top queens and one with two twins that can be converted to a king size. Our large utility room has a bunk bed with a full size futon. Our linens are of high thread count to add to your comfort. The living room is furnished with a leather sofa, love seat and a large HD 55" LED TV with all networks and movie channels for your indoor entertainment plus a Blu-Ray DVD player with a large Blu-Ray library. The kitchen is stocked with everything you can think of (so we have been told). A generous supply of breakfast items and staples are provided. A large Weber BBQ is located on upper Patio outside the kitchen entrance for your barbecuing pleasure! All laundry, paper products and bath supplies are provided plus much more! To add to the comfort of our guests the house is heated with radiant in floor heat throughout. The Hidden Cove beach has an Alaskan sandy beach with lots of neat beachcombing finds! Our Hidden Cove boat house is decorated with a nautical theme and has a full size bed in the loft for the more adventurous sole. It's a great place to enjoy your morning coffee. A rental car is recommended and frees you to all Ketchikan has to offer. Everything is just minutes away! We are now on the bus route with hourly service to town with fares at just a couple bucks!. Fantastic hiking trails are just minutes away. Limited dates available for the 2019 season so plan ahead! Check in time is 4 pm and check out is at 10:30 am. Ray and Kathy met in 1998 and both were building beachfront homes at the time. We married in 1999 and Ray's house was finished first so we decided to do a vacation rental with the Hidden Cove home. It has been a very rewarding experience for us as we have met so many wonderful people. Check out the sunset at Hidden Cove!! We feel this is the nicest most private beachfront location on our island. We feel extremely lucky to own it and to share the beauty with so many families and groups. We hope to see you soon at Hidden Cove. Book early as we have been (the last few years) almost fully booked for the next Peak season as early as September. To have this remoteness and be conveniently located is truly amazing! 413 feet of your own beach! Very nice! Over 3 acres which make's this the most private, secluded vacation rental in Southeast Alaska and so close to all conveniences! NOTE: Game room/Garage with ping pong and foosball tables are available only during the summer season. Patio table and chairs with Umbrella for those hot Alaskan summer days. Really! The best home away from home I’ve ever experienced. Very professional host. I don’t even want anyone to know about this amazing house! I absolutely recommend this if you have a family or just want to be away from the downtown area. Most beautiful place I’ve ever stayed! You were very brave to book in the winter season and I'm so glad it worked out so well for you. Thank you for staying at Hidden Cove and we look forward to your next visit! A wonderful experience not to be missed! Stunning performance by our hosts, Kathy and Ray. The entire experience was bucket-list level. The island itself was delightful. This beautiful house on the water was superbly maintained, clean, and comfortable. Wildlife and forest all around. Kathy and Ray go out of their way to make your vacation a real treat. They are even thoughtful enough to have breakfast food waiting in the frig and bubble bath to relax you. Hats off to our hosts! This is the second time staying at this amazing home. I can use the word home freely because when you walk in the first thing you can tell is that a lot of love and attention was given to this vacation rental to make it feel just like home. Ray and Kathy have thought of everything, from the well stocked kitchen and bathrooms to the incredibly comfortable beds. When we arrived they had left a basket of food to welcome us and the refrigerator had eggs, milk, orange juice and fresh condiments. We have stayed at many VRBO properties and no one has anyone supplied us with so many goodies! The outside is filled with wildlife. This included bald eagles, jumping salmon and whales! The hiking in the area is absolutely beautiful! Our two boys, ages ten and thirteen couldn't have been happier! It was so refreshing to watch them skip rocks, search for sea critters or just relax and take in the scenery! Computer games were forgotten and they just played outside. If you have the opportunity to stay at this home you will have no regrets. We wish we could have stayed for a month. Hidden Cove Beach House is even better in person and it's hard to mention everything this property has to offer. Thank you Ray and Kathy for making this vacation home a spot that we can return to over the years and for the memories that will last our family a lifetime! Thanks so much for your generous feedback. We're glad it felt like home to you and it would be wonderful to see your family at Hidden Cove again. Super nice home, well maintained and inviting. We had a great time walking the beach and found a few pieces of beach glass. Great fire pit with an awesome view. Had roasted marshmallows and watched a meteor storm. Very private, plenty of parking and great location on the hidden cove. Can't wait to get back. We're glad you had a good stay and a clear night to enjoy the stars! If you want a vacation home that will leave you in awe, this is it! Kathy and Ray have the best and most perfect home. We use VRBO extensively and this home is the one that we talk about the most. The pictures do not really do it justice. When you reach this home you feel that you are in an alternate universe and the rest of the world does not exist even though there is a store about 3 minutes from you. The ocean is at your doorstep, literally. The bald eagles have made their home in your backyard. The fire pit overlooks the ocean and is just the place to meet in the evening for smores and more. Fishing is extensive in the area with many charters and boat rentals as well as off shore fishing. Ketchikan is about 25 to 20 minutes from the home with many touristy type activities. We have been to this home twice and will return again. It is so well stocked with every item you could ever want or need. The house is so clean that you can eat off the floors. The condition is so good that it looks new even though it is not. Beds were incredible and sleep was amazing. This house has internet as well as cable, an exercise bike, ping pong table and foozeball. There are ample dvd's available as well as you can rent them from the local Safeway, which by the way, has a Starbucks! I could go on and on about this wonderful home, but you just need to go and enjoy the VRBO of a lifetime. Thanks you Kathy and Ray for making such an experience available. The Hidden Cove Beach House is a very short walk(across the street!) from a large convenience store (beer,wine and spirits) fishing license, gas station etc. A brand new restaurant/bar (The Last Frontier) is just a quarter mile down the road. We are located on the city bus route. Bus leaves at 10 minutes past the hour and cost is $1.00. Both marinas(rent boats, kayaks,fishing charters,fishing gear,and tours) are just three miles from Hidden Cove. Fantastic hiking trails are minutes away. Downtown Ketchikan is a fifteen minute drive. The best part of Hidden Cove is it is so close to everything but yet it feels as if you are on your own island! Please read our reviews. PEAK SEASON RATE IS FOR 4 GUESTS plus $50.00/night for each additional guest including children. Off season rate is for 3 guests plus $35.00/night for each additional guest including children on the daily rate, $25.00/night for each additional guest if rented by the week. Stays less than 7 nights will be considered to fill empty nights. Damage protection fee may be added for some reservations. DISCOUNTED RATES: October-April weekly & monthly rates available. Stays of 30 days or more: tax is capped at $25/month. Rates are subject to change until reservation is confirmed.